With all this hot weather, a much needed cool-down is welcome. I know that I always love a chill hangout with great drinks and casual, tasty food for an after work pick-me-up. That's why when I got invited to sample the food and drinks at The Sunburnt Calf on the Upper West Side, I immediately latched on to the invitation (I know...that was bad). And I know you're probably wondering why I'm drinking out of a baby bottle. I'll explain that and much more...just keep reading. Very similar in appearance to its sibling, The Sunburnt Cow in the East Village, The Calf is an unassuming yet lively bar and eatery. The front is more of a bar scene, just like at The Cow and the back offers nice, comfortable dining digs with a raised glass ceiling. Apart from the fact that it was dark and rainy during our visit, I can see the roof really bringing in light and cheeriness on nice days. The overall vibe was fun and relaxed and as you can see from my pictures, the owners promote a playful atmosphere. 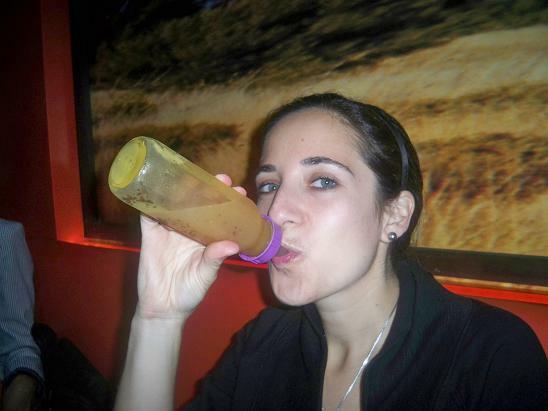 In honor of The Calf, they serve mixed drinks in baby bottles for patrons to actually use (like me!) or to just get a good laugh out of. It certainly breaks the tension of stressful city life - and as I think back on our experience, I remember Dan and I laughing a lot. The menu has influences from the Sunburnt Cow, with popular items such as the Calamari Oz style and oyster shooters, but aside from that, it has its own personality too. We tried to stick with seafood dishes but Dan also tried the pork and we of course saved room for dessert. The drinks were a big highlight of the evening, offering inventiveness and whimsical flare. We started out with an oyster tasting, including a potent oyster shooter in a Bloody Mary mix as well as oysters Kilpatrick, which were fried and seasoned with smoky bacon bits. 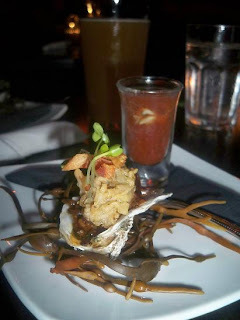 Both were really fresh and tasted like the sea - the shooter had a spicy after bite and the Kilpatrick was just pure indulgence. I could've popped at least three of those babies. Taking it up another notch with seafood, we also ordered their signature Calamari Oz, which I already enjoyed at The Cow as well as a new starter called Shrimp on the Barbie. Not only was the shrimp smoky from the bbq sauce, but the whole dish carried out a fresh, summery feel with a bed of spicy avocado, sweet mango and crunchy red onion. I'd recommend getting this on a very hot day - it was a great picker-upper. I'm really not sure why I keep doing this to myself, but I once again ordered the Barramundi. The first time I had it at Bondi Road, it didn't impress me and yet again, it didn't do it for me at The Calf. Unlike the one I had at Bondi Road, this one was grilled and served with a tomato, papaya and shrimp salad, with a side of shoestring fries, which resembled potato stix. I guess it was their version of fish and chips. Take it from me - you can skip this one unless you know for a fact that you love barramundi. 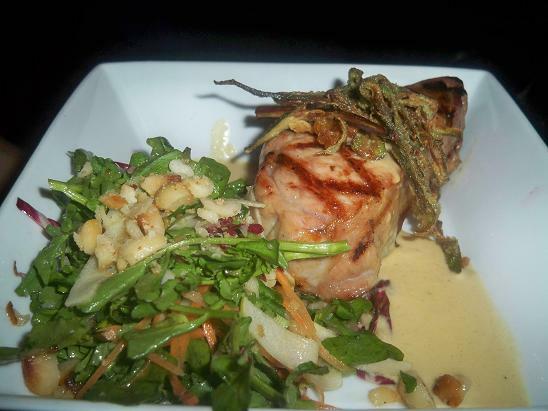 Dan was smarter in his choice by getting the grilled pork loin, marinated in brown sugar and red pepper. YUM! It was absolutely delicious and so tender--the meat had so much flavor and a lovely sweetness from the brown sugar. Its tenderness was a delight for your fork and knife, not to mention your palate. A colorful side salad of watercress, macadamia nuts, apples, carrots and radicchio brought forth some earthiness along with a pop of flavor from the spicy Dijon mustard dressing. We just couldn't refuse a healthy dose of chilled desserts and ordered the Peach Melba and the Banana Fritters, both served with the most delicious vanilla ice cream. 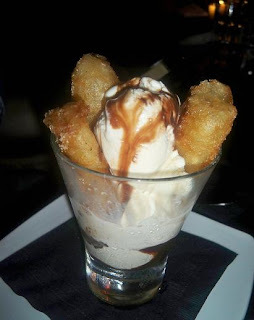 The banana fritters were just decadent, beautifully crispy on the outside and soft and warm on the inside. They were juxtaposed well with the cold ice cream and the syrupy chocolate sauce on top. If you're a fan of the banana/chocolate combo, this one's for you. The Peach Melba was also an excellent choice, with a grilled peach and strawberry sauce on top. I liked that they incorporated a lady finger that stuck out of the ice cream - judging by the funky attitude of this place, it seemed almost as if they were flipping us the bird, in the nicest way possible. We totally dug it! As I already hinted several times, the drinks were awesome. So even if you're not feeling hungry, definitely come by for cocktails. As you can see, I really loved my Island drink - a mixture of pine-coconut Bacardi and fresh guava juice. It came in their signature baby bottle and I of course took full advantage. Note to self - this drink is delicious but it has a lot of pulp. Therefore, if you do choose to channel your inner babe, make sure to poke a bigger hole in the bottle. Dan got an equally interesting drink called The Oasis. The presentation was just wild, consisting of an inverted lime filled with tequila, sitting on top of a concoction of strawberry, watermelon, blackberry and a splash of pineapple-lime. Instead of describing it here, I'll let you watch the video. And as you can see, I was past drinking my bottle when I said "Dan is about to take a shoot." Who says that?! Just like the atmosphere, the food and the drinks, The Calf's service is also super fun. The staff jokes around with you and I have to mention that they sport really awesome Aussie accents. You'll be treated with care and respect but you'll also laugh and joke around to your heart's content. And it almost feels like you're in a different country - it's a good thing! The Calf offers a Saturday/Sunday "Endless Brunch" for $18, which gets you a brunch entree and all-you-can-drink cocktails.